Location: Benayes, in the Limousin departement of France (Limousin Region). Notes: Château de Forsac is on Benayes town of Corrèze. The first traces of its construction dates back to the thirteenth century. The architecture of the castle is going to experience significant changes during the sixteenth century and nineteenth century.Forsac Castle is situated on top of a hill. Featuring architecture of the thirteenth century, sixteenth and nineteenth century, it is divided into three floors. The park contains remarkable elements such as plane trees whose plants, according to family tradition, were given by Queen Marie Antoinette to an ancestor of the current owners. You can see a cage that served to Count Chérade Montbron transporting lions in the nineteenth century. 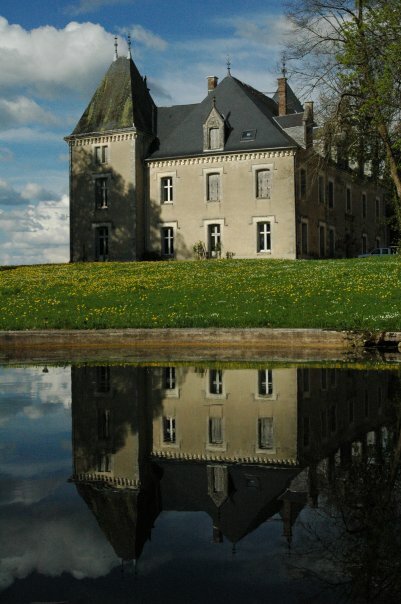 Castle Forsac erected in the thirteenth century has undergone transformations over the centuries. ll only two witnesses towers of the architecture of the old castle fort. There was a pool that was an area of about 2 hectares. We can situate from the Cassini maps and more precisely from the Napoleonic cadastre. An article from 1839 in the World Scholar Echo indicates that the pond still existed at that date.